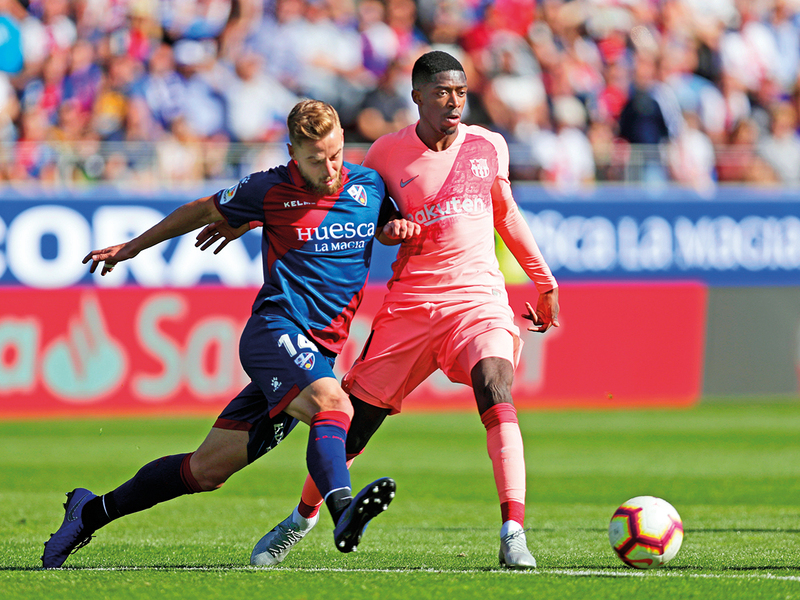 Huesca: La Liga leaders Barcelona were held to a goalless draw by basement club Huesca on Saturday after coach Ernesto Valverde made sweeping changes to his line-up ahead of Tuesday’s Champions League quarter-final decider against Manchester United. Barca lead the standings with 74 points with six games left although their advantage was reduced to nine points after second-placed Atletico Madrid beat Celta Vigo 2-0. With the title nearly assured after last weekend’s 2-0 win over Atletico, Valverde fielded a radically different side to the team that won 1-0 at Old Trafford in Wednesday’s first leg, making 10 changes and giving three players their league debuts. Top scorer Lionel Messi was left at home for the game after being struck in the face by United defender Chris Smalling, Ivan Rakitic and Sergio Busquets were also rested while both Gerard Pique and Luis Suarez were suspended. Goalkeeper Marc-Andre ter Stegen was the only player who started at Old Trafford to make the starting line-up against Huesca, although Barca were boosted by the return of France forward Ousmane Dembele after a month out injured. Barca midfielder Arturo Vidal was happy to admit that his side’s minds were more focused on getting beyond the Champions League quarter-finals for the first time since 2015 than on the game they were playing on Saturday. “I think everyone that was playing today was thinking about Tuesday’s game, just like the guys who stayed at home. The Champions League is what everyone is dreaming about,” said the Chilean. Midfielder Riqui Puig was one of Barca’s debutants and the 19-year-old produced the best moment of an uneventful first half, picking out Dembele with a wonderful pass but the Frenchman dragged his shot wide. “There were a lot of changes and a few debuts so we’re happy in general with the game though we could have been more ambitious in attack,” added Barca coach Ernesto Valverde. “It was a difficult situation with so many new players but I understood it was what we needed to do today.” Huesca desperately needed a win to keep up their slim hopes of avoiding relegation but they struggled to make much of an impact and stay rooted to the bottom of the standings with 25 points from 32 games.